Click to grab a copy today! Are you familiar with Attainable Sustainable? After realizing that her friends were asking her questions about composting, gardening, chickens and the life because she grew up on a farm, Kris Bordessa created Attainable Sustainable with the hope that sharing her experiences with sustainable living techniques will inspire others who want to go down that path as well. Real food recipes, organic gardening articles, and her own projects successes and failures are why I’ve been reading her blog for years. Kris got together with other food bloggers to create a wonderfully useful book called Off the Shelf: Homemade Alternatives to the Condiments, Toppings, and Snacks You Love. Off The Shelf is a wonderful assistant to have at your side when you make the decision to limit or remove processed foods from your diet. You can fill your pantry with your necessary staples and healthy snacks with quality ingredients for less than the market retail price! I truly prefer the flavors of foods that I make myself, with ingredients that I have chosen. There’s nothing that beats the satisfaction of knowing how to make the perfect gravy or opening a can of jam from the summertime in the middle of winter. Imagine a greener and cheaper way to eat, where you spend a little bit more time to create your own foods and condiments. You can generate less packaging from buying bulk ingredients and reducing ready-to-eat snacks, you can save money by buying in bulk and blending your own spice mixes and kitchen “cheats”, all while reducing your family’s intake of high fructose corn syrup, preservatives and food dyes. It is empowering to make your own food! 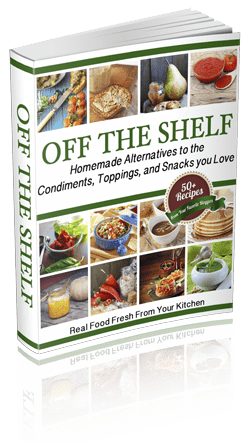 Off the Shelf has over fifty recipes from food bloggers, including staples like mayonnaise, mustard, jam and jelly, plum sauce, pickles, tomato paste, marshmallows, DIY food coloring, and so much more! There’s plenty of photographs to accompany the well-explained techniques so you aren’t left feeling stranded in a new project. You can see an example of a recipe ingredient list for Garlic Aioli at the bottom of this review. Get Off The Shelf for just $6.98 with an instant download. You can read it with any PDF reader or print out to have on hand if you prefer tangible pages (I do! ).